RS Aggarwal Solutions for Class 6 Math Chapter 21 Concept Of Perimeter And Area are provided here with simple step-by-step explanations. These solutions for Concept Of Perimeter And Area are extremely popular among class 6 students for Math Concept Of Perimeter And Area Solutions come handy for quickly completing your homework and preparing for exams. All questions and answers from the RS Aggarwal Book of class 6 Math Chapter 21 are provided here for you for free. You will also love the ad-free experience on Meritnation’s RS Aggarwal Solutions. All RS Aggarwal Solutions for class 6 Math are prepared by experts and are 100% accurate. Find the cost of fencing a rectangular field 62 m long and 33 m wide at Rs 16 per metre. The length and the breadth of a rectangular field are in the ratio 5 : 3. If its perimeter is 128 m, find the dimensions of the field. 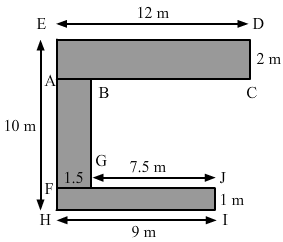 Let the length of the rectangle be 5x m.
It is given that the perimeter of the field is 128 m.
The cost of fencing a rectangular field at Rs 18 per metre is Rs 1980. If the width of the field is 23 m, find its length. Let the length of the field be x metre. Hence, the length of the field is 32 m.
The length and the breadth of a rectangular field are in the ratio 7 : 4. The cost of fencing the field at Rs 25 per metre is Rs 3300. Find the dimensions of the field. Let the length and the breadth of the rectangular field be 7x and 4x, respectively. It is given that the perimeter of the field is 132 m.
The cost of putting a fence around a square field at Rs 35 per metre is Rs 4480. Find the length of each side of the field. Let the length of each side of the field be x metres. Hence, the length of each side of the field is 32 m.
Each side of a square field measures 21 m. Adjacent to this field, there is a rectangular field having its sides in the ratio 4 : 3. If the perimeters of both the fields are equal, find the dimensions of the rectangular field. Let the length and the breadth of the rectangular field be 4x and 3x, respectively. (iii) an isosceles triangle with equal sides 8.5 cm each and third side 7 cm. (i) Sides of the triangle are 7.8 cm, 6.5 cm and 5.9 cm. (ii) In an equilateral triangle, all sides are equal. ∴ Circumference of the circle, C=2πr =(2×227×28) =176 cmHence, the circumference of the given circle is 176 cm. ∴ Circumference of the circle, C=2πr=(2×227×10.5)=66 cmHence, the circumference of the given circle is 66 cm. ∴ Circumference of the circle, C=2πr=(2×227×3.5)=22 mHence, the circumference of the given circle is 22 m.
Circumference=2πr =π(2r) =π× Diameter of the circle (d) (Diameter=2×radius)⇒Circumference=Diameter×π Diameter of the given circle is 14 cm. Circumference of the given circle=14×π ⇒(14×22 7)=44 cm Circumference of the given circle is 44 cm. Circumference=2πr =π(2r) =π×Diameter of the circle(d) (Diameter=2×Radius)⇒Circumference=Diameter×π Diameter of the given circle is 35 cm. ⇒Circumference of the given circle=35×π ⇒(35×22 7)=110 cm Circumference of the given circle is 110 cm. Circumference=2πr =π(2r) =π×Diameter of the circle(d) (Diameter=2×Radius)⇒Circumference=Diameter×π Diameter of the given circle is 10.5 m. Circumference of the given circle=10.5×π ⇒(10.5×22 7)=33 m Circumference of the given circle is 33 m.
Find the radius of a circle whose circumference is 176 cm. Let the radius of the given circle be r cm. ∴ 2πr=176 ⇒r=1762π⇒r=(1762×722) ⇒r=28 The radius of the given circle is 28 cm. Find the diameter of a wheel whose circumference is 264 cm. Let the radius of the circle be r cm.Diameter=2×Radius=2r cmCircumference of the wheel=264 cmCircumference of the wheel=2πr∴2πr=264⇒2r=264π⇒2r=(264×722)⇒2r=84 Diameter of the given wheel is 84 cm. Find the distance covered by the wheel of a car in 500 revolutions if the diameter of the wheel is 77 cm. In 1 revolution the wheel covers a distance equal to its circumference. The diameter of the wheel of a car is 70 cm. How many revolutions will it make to travel 1.65 km? Radius of the wheel(r)=Diameter of the wheel2r=702cm=35 cmCircumference of the wheel = 2πr =(2×227×35) =220 cmIn one revolution, the wheel covers the distance equal to its circumference.∴ 220 cm distance =1 revolution∴1 cm distance =1220 revolution∴1km (or 100000 cm) distance =1×100000220 revolution (∴ 1 km=100000 cm)∴1.65 km distance = 1.65×100000 220 revolutions = 750 revolutions Thus,the wheel will make 750 revolutions to travel 1.65 km. Count the number of squares enclosed by figure and find its area, taking the area of each square as 1 cm2. 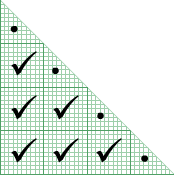 The figure contains 12 complete squares. 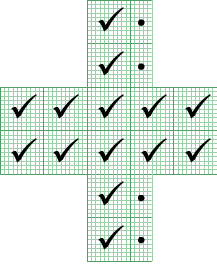 The figure contains 18 complete squares. The figure contains 14 complete squares and 1 half square. 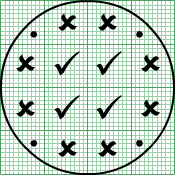 The figure contains 6 complete squares and 4 half squares. The figure contains 9 complete squares and 6 half squares. 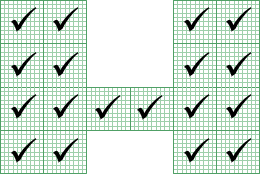 The figure contains 16 complete squares. 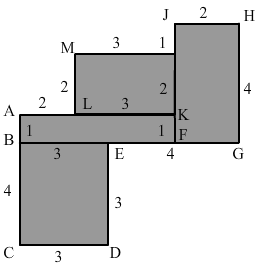 In the given figure, there are 4 complete squares, 8 more than half parts of squares and 4 less than half parts of squares. We neglect the less than half parts and consider each more than half part of the square as a complete square. 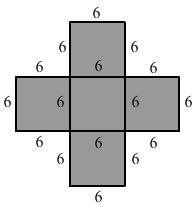 In the given figure, there are 9 complete squares, 5 more than half parts of squares and 7 less than half parts of squares. We neglect the less than half parts of squares and consider the more than half squares as complete squares. 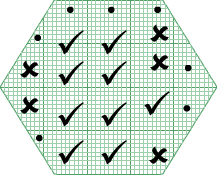 The figure contains 14 complete squares and 4 half squares. Find the area of a square plot of side 14 m.
A carpet is 30 m 75 cm long and 80 cm wide. Find its cost at Rs 150 per square metre. How many envelopes can be made out of a sheet of paper 3 m 24 cm by 1 m 72 cm. If each envelope requires a piece of paper of size 18 cm by 12 cm? A room is 12.5 m long and 8 m wide. A square carpet of side 8 m is laid on its floor. Find the area of the floor which is not carpeted. A lane, 150 m long and 9 m wide, is to be paved with bricks, each measuring 22.5 cm by 7.5 cm. Find the number of bricks required. A room is 13 m long and 9 m broad. Find the cost of carpeting the room with a carpet 75 cm broad at the rate of Rs 65 per metre. Let length of required carpet be x m.
So, the length of the carpet is 156 m.
The length and the breadth of a rectangular park are in the ratio 5 : 3 and its perimeter is 128 m. Find the area of the park. Let the length of the rectangular park be 5x. It is given that the perimeter of rectangular park is 128 m.
Two plots of land have the same perimeter. One is a square of side 64 m and the other is a rectangle of length 70 m. Find the breadth of the rectangular plot. Which plot has the greater area and by how much? Let the breadth of the rectangular plot be x m.
So, the breadth of the rectangular plot is 58 m.
Area of the square plot is 36 m2 greater than the rectangular plot. The cost of cultivating a rectangular field at Rs 35 per square metre is Rs 71400. If the width of the field is 40 m, find its length. Also, find the cost of fencing the field at Rs 50 per metre. Let the length of the field be x m.
The area of a rectangle is 540 cm2 and its length is 36 cm. Find its width and perimeter. Let the width of the rectangle be x cm. It is given that the area of the rectangle is 540 cm2. A marble tile measures 12 cm × 10 cm. How many tiles will be required to cover a wall of size 4 m by 3 m? Also, find the total cost of the tiles at Rs 22.50 per tile. Thus, the total cost of the tiles is Rs 22500. Find the perimeter of a rectangle whose area is 600 cm2 and breadth is 25 cm. 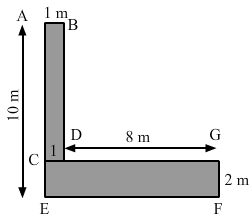 Breadth of the rectangle is 25 cm. It is given that the area of the rectangle is 600 cm2. So, the length of the rectangle is 24 cm. Find the area of a square whose diagonal is 52 cm. (iii) In the figure, there are 5 squares, each of whose sides are 6 cm in length. Let the length and the breadth of the rectangle be 7x cm and 5x cm, respectively. 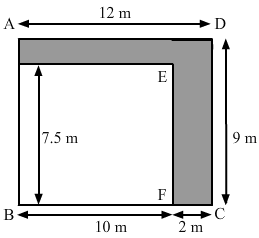 It is given that the perimeter of the rectangle is 96 cm. Let length of the rectangle be L cm. Let the breadth of the rectangular field be x m.
⇒2(24+x)=80⇒48+2x=80⇒2x=(80-48)⇒2x=32⇒x=322=16So, the breadth of the rectangular field is 16 m.
Let the length and the breadth of the rectangle be L m and B m, respectively. Let the width and the length of the rectangle be x cm and 3x cm, respectively. 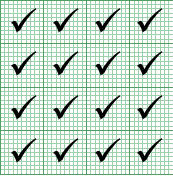 (Diagonal)2=(Length)2+(Width)2⇒(610)2=(3x)2+(x)2⇒360=9x2+x2⇒360=10x2⇒x2=36010⇒x2=36⇒x=±6Since the width cannot be negative, we will neglect -6. So, width of the rectangle is 6 cm. Let the breadth of the plot be b cm. Let the length of the plot be x cm. Let one side of the square field be x m.
⇒4x=80⇒x=804⇒x=20Each side of the field is 20 m.
The diameter of a wheel of a car is 70 cm. How much distance will it cover in making 50 revolutions? A lane 150 m long and 9 m wide is to be paved with bricks, each measuring 22.5 cm by 7.5 cm. How many bricks are required? How many envelopes can be made out of a sheet of paper 72 cm by 48 cm, if each envelope requires a paper of size 18 cm by 12 cm? (iii) an isosceles triangle with equal sides 6 cm each and third side 4.5 cm. (i) Sides of the triangle are 5.4 cm, 4.6 cm and 6.8 cm. The perimeter of a rectangular field is 360 m and its breadth is 75 m. Find its length. Let the length of the rectangle be x m.
It is given that the perimeter of the field is 360 m.
So, the length of the rectangle is 105 m.
The length and breadth of a rectangular field are in the ratio 5 : 4. If its perimeter is 108 m, find the dimensions of the field. It is given that the perimeter of the field is 108 m.
Find the area of a square whose perimeter is 84 cm. Let one side of the square be x cm. It is given that the perimeter of the square is 84 cm. The area of a room is 216 m2 and its breadth is 12 m. Find the length of the room. Let the length of the room be x m.
It is given that the area of the room is 216 m2. Hence, the circumference of the given circle is 44 cm. The diameter of a wheel of a car is 77 cm. Find the distance covered by the wheel in 500 revolutions. In 1 revolution, the wheel covers a distance equal to its circumference. Find the diameter of a wheel whose circumference is 176 cm. Thus, the diameter of the given wheel is 56 cm. Find the area of a rectangle whose length is 36 cm and breadth 15 cm. Let the breadth of the rectangle be x m.
It is given that the area of the rectangle is 240 m2. So, the breadth of the rectangle is 15 m.
It is given that the area of the square is 256 cm2. We know that the side of a square cannot be negative. So, we will neglect −16. Therefore, the side of the square is 16 cm. It is given that the area of the rectangle is 126 m2. ⇒12x=126⇒x=12612=10.5So, the breadth of the rectangle is 10.5 m.
(i) A polygon having all sides equal and all angles equal is called a ...... polygon. (ii) Perimeter of a square = ...... × side. (iii) Area of a rectangle = (......) × (......). (iv) Area of a square = ...... .
(v) If the length of a rectangle is 5 m and its breadth is 4 m, then its area is ...... .